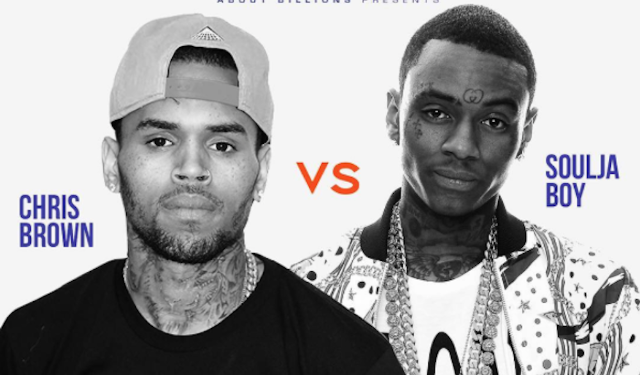 Chris Brown has refused to sign the contract for his proposed boxing match with Soulja Boy, causing the fight to be cancelled. The ‘Loyal’ hitmaker and the 26-year-old rapper have been embroiled in a bitter feud since Chris vowed to fight the ‘Kiss Me Thru The Phone’ musician – real name DeAndre Cortez Way – for liking a picture of his ex-lover Karrueche Tran on Instagram. The pair were due to settle their differences in the ring in an organised bout consisting of three rounds, which would have seen ‘Crank That’ hitmaker Soulja Boy – who was being trained by undefeated boxing great Floyd ‘Money’ Mayweather – take on 27-year-old Chris, who was being coached by retired heavyweight legend ‘Iron’ Mike Tyson. Soulja Boy took to Twitter on Monday to shut down talk of the match, claiming that Chris had refused to sign the contract committing to the bout. Soulja Boy also roamed the streets on Compton in Los Angeles County back in January to look for Chris to challenge him to a brawl before they announced their planned boxing match.